Pork Chops in Wine Sauce are an amazing recipe that will be on your dinner table in 30 minutes. Heat butter and olive oil in a cast-iron skillet or other oven-safe pan over medium-high heat. Use a paper towel to dry pork chops as much as possible, and season generously with salt and pepper. When oil and butter are hot, sear pork chops seasoned-side down in oil. Season top of pork chops and flip to sear. Remove pork chops. Lower heat to medium-low and add onions. You may need to add a little more oil to the pan. Let onions sauté and slowly soften and brown, about 10-15 minutes. Once onions are soft and beginning to caramelize, remove from pan. With pan over medium-low heat, carefully pour in cup of white wine and deglaze bottom of pan. Add Dijon mustard, thyme leaves, lemon juice, and garlic and stir to create a sauce. 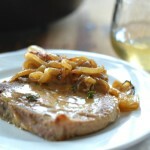 Return pork chops and onions to pan and spoon sauce over pork chops. Place pan in oven to finish cooking, about 7-10 minutes depending on the thickness of your pork chops. Remove from oven, serve pork chops with onions and sauce, and enjoy!